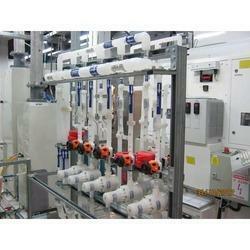 Service Provider of Clean Room PVDF Piping Services. Our product range also comprises of PP Socket Fusion, Piping Grid and PP Chemical Tanks. With the support of adroit team of expert, we are able to present our clients premium quality Clean Room PVDF Piping Services. We have skilled team of engineers who have rich industry experience in this domain and render these services as per the client’s diverse requirements. Our team of dexterous professionals works in close coordination with our clients to figure out the accurate requirements of our clients and then accordingly plan for installation of pipes.